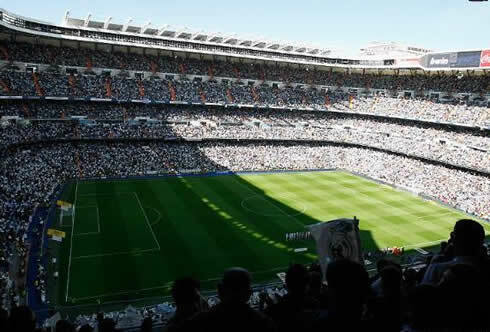 Real Madrid ran over Osasuna this Sunday morning by 7-1, in a match played at 12:00 in the Santiago Bernabéu. Cristiano Ronaldo scored his 4th hat-trick of the season and his first two header goals in this year's La Liga. The game ended up by being completely dominated by Real Madrid, with a total of 73% ball posession, which allowed Nuri Sahin to make his debut during the 2nd half. There was much expectation towards this Real Madrid and Osasuna clash, to be held in a Sunday morning schedule. An over-crowded Santiago Bernabéu witnessed another impressive victory from the Merengues, as Real Madrid crashed Osasuna by 7-1, with goals by Cristiano Ronaldo (3), Pepe, Higuaín and Benzema (2). During the 2nd half, Nuri Sahin finally had his debut in La Liga, but the negative note of this match took place when Angel Di María suffery an injury. First reports suggest that the Argentinian player could be out for a few weeks. Before the referee's whistle for the game to begin, Real Madrid starting eleven stepped up to the pitch wearing a Antonio Cassano's number 19 jersey, as a way of showing their support for the former "Merengue" player. The shirts had an Italian written message in the front, saying: "Forza Cassano" (Be strong Cassano). The AC Milan player suffered a stroke when returning from a game played in Rome, just a few days ago. After that strong emotional moment, Cristiano Ronaldo showed the Santiago Bernabéu his Golden Shoe (Boot) trophy, which he received on this past Friday. The match started in a slow rhythm, as if everyone was still a bit sleepy and affected by the early hours. Osasuna showed right from the start that they were not going to have a very offensive stance on this game, which is something that Real Madrid is already used to, when playing at the Santiago Bernabéu. It took nearly 23 minutes for the crowd to see the first goal and whoelse but Cristiano Ronaldo to open hostilities. The Portuguese player headed backwards a magnific cross from Angel Di María, chopping the ball over Osasuna's goalkeeper, Andrés. However, just 8 minutes later, Osasuna was awarded a dangerous free-kick near Real Madrid's penalty area. The Merengues were caught off guard and while still discussing with the referee, Osasuna took the free-kick quickly, allowing Ibrahima Baldé to be granted a 1 on 1 situation with Iker Casillas and making the equaliser. As expected, Real Madrid reacted fiercely and less than 5 minutes later, the lead got restored, after another good cross from Di María, who ended by meeting Pepe's head. The Portuguese defender headed the ball out of Osasuna's goalkeeper reachto make it 2-1. Real Madrid didn't slow down from that point on, and they would still manage to extend the lead before half-time, in a great goal by Gonzalo Higuaín. The Argentinian forward had to get rid of a defender before finishing with style, in a strike that left no chance for Andrés to stop. The half-time had reached and as in previous games, Real Madrid felt the game was completely controlled by then. In Real Madrid last matches, the team has been slowing down the game's tempo everytime the score allows them to do so. However, José Mourinho's men seemed to have different instructions this Sunday morning, as they came from the locker rooms looking to push forward and going after more goals. In the 54th minute, Mesut Ozil got tackled inside the penalty area, resulting in Osasuna's defender being sent off. Cristiano Ronaldo was then allowed to show how good he is from the penalty spot. It has been a long-time since Ronaldo missed a penalty and this morning, he easily fooled the goalkeeper to make his 2nd of the game. Ronaldo decided to come up to the 2nd half with a new hairstyle (his hair was pulled back) and he seemed very motivated to add more goals to his tally. It didn't take too long for the Portuguese player to reach his hat-trick, since close to the 58th minute, CR7 managed to head another ball to the back of the net, this time from a good cross made by Alvaro Arbeloa. Osasuna was teared apart and the Pamplona's side main worry at that time, was simply to prevent the lead from being extended. In the other hand, Real Madrid kept with their attacking trend and near the 63th minute, Benzema, who had replaced Angel Di María after the Argentinian suffered an injury, would easily finish a great play and cross made by Fábio Coentrão. The French man would still score another and set the final, score close to the 81th minute, in a great finish with his left-foot, putting the final scoreline at 7-1 for Real Madrid. Nuri Sahin finally had his official debut for Real Madrid, after replacing Sami Khedira in the 67th minute. The Turkish player will certainly need a few more weeks or months to recover his best form, but he definately won't miss any support from the fans, who welcomed him with a very warm applause. Moreover, the crowd has also been heard chanting "Bota de Oro, Cristiano, Bota de Oro" (Golden Ball, Cristiano, Golden Ball), in a clear allusion to FIFA's Balon d'Or award for the Best Player in the World, who's winner will be announced in the 12th of January, 2012. Despite those good interactions between the public and Real Madrid players, Mourinho has left a few remarks on the crowd's apathetic and somehow timid behaviour during the game. The Portuguese coach expressed his wish of seeing the fans being more noisy during future games, because the team will surely need that. Mourinho: "If it wasn't for the fans behind goal (Real Madrid "Ultras Sur" supporters), I would have felt that there was no one in the stadium", noted the "Special One". The MVP of the match, Cristiano Ronaldo, has also commented Nuri Sahin's debut, as well as the unusual time schedule for this game. Ronaldo: "The most important thing was to win. We're not used to play at 12:00, so we got slightly affected by that in the first half, but we had a great perform after the half-time. We won our match and we'll keep leading La Liga." The Portuguese player then added: "We had a good night of sleep, but it has been a bit hard to play in the morning. I liked it though, just as I do enjoy when we play in the afternoon." CR7 last comments were meant to encourage and motivate Nuri Sahin. Ronaldo: "He has been perfect. I was already expecting that he would make his debut today and I think he played very well. It's important that he keeps growing his confidence." 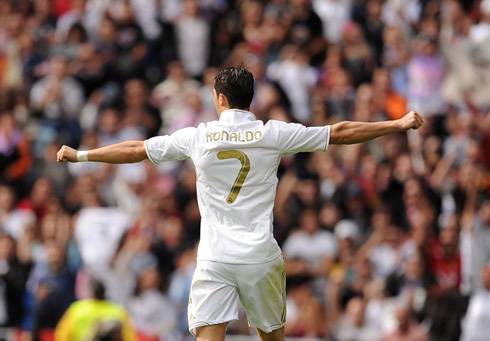 Real Madrid next match is against Valencia, for La Liga, in the 19th of November 2011. Cristiano Ronaldo will now join the Portuguese National Team to prepare the 2-game playoff stage against Bosnia Herzegovina, on the 11th and the 15h November of 2011.